the Priority Implementation Partnership (PIP) on mainstreaming DRR in the housing sector in Sri Lanka. 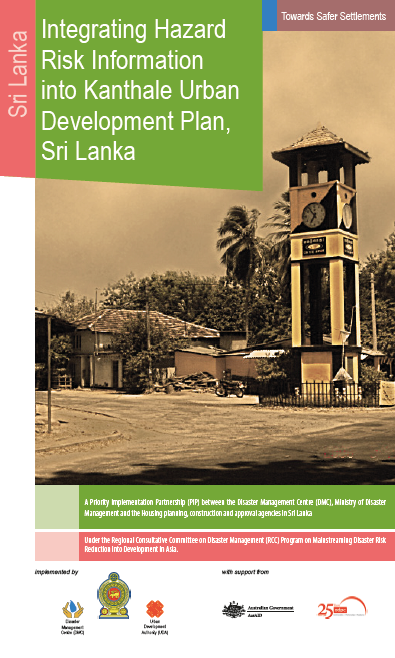 Urban planning being an integral part of housing development, the PIP took special emphasis in looking at integrating DRR in the urban planning processes, with an objective of enhancing enabling environment for housing development in Sri Lanka. Thus the multi-agency housing sector technical working group formed under the PIP provided technical support to UDA by demonstrating integration of hazard risk information in the Kanthale Development Plan, which is being formulated by UDA.